His friends are flung far and wide across Carthya and its neighbouring lands. In a last-ditch effort to stave off what looks to be a devastating loss for the kingdom, Jaron undertakes what may be his last journey to save everything and everyone he loves. But even with his lightning-quick wit, Jaron cannot forestall the terrible danger that descends on him and his country. Along the way, will he lose what matters most? And in the end, who will sit on Carthya’s throne? Rousing and affecting, Jaron’s adventures have thrilled and moved readers in The False Prince and The Runaway King. 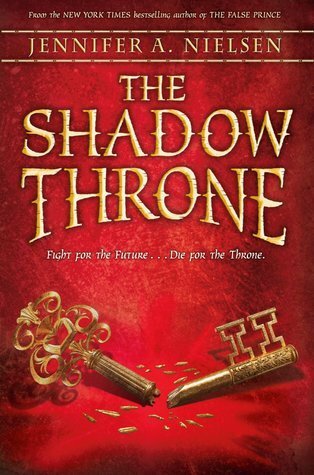 Journey once again with the Ascendant King of Carthya, as New York Times bestselling author Jennifer A. Nielsen brings his story to a stunning conclusion with The Shadow Throne.